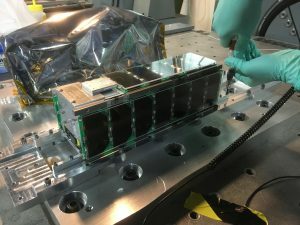 After some hardware changes to MinXSS-2 to implement lessons learned from MinXSS-1’s time on orbit, it was prudent to do another vibration test to ensure the new components would still make it through the upcoming rocket launch. The major new addition was a power relay board that gives us the ability to remotely command a full spacecraft reboot. We also added a thermal strap to our radio to keep it cool during 10-minute duration data downlinks. The vibration test was successful, and showed that these new components shouldn’t cause any problems.